jobs paying above this level. 2007. Our best guess is that a lot of additional teenagers will be pursuing those other activities. educated, least skilled and least experienced segment of the U.S.
do anything to make the teenagers themselves disappear. The increase in minimum wage earners in some of the middle brackets is likely due to a sweeping effect -- if the minimum wage is increase from $6 to $7, people making $6.50 before are swept into the "minimum wage" characterization. Hat tip to Warren: he describes the "sweeping" effect for the older age groups better than I did! One effect I'm wondering about is whether teenage minimum wage jobs are the "first to go" when economic times get tough. I care more about 20-24 year olds than teenagers. One of the arguments against raising the minimum wage was that a big portion of the increase goes not to full-time minimum-wage workers, who are somewhat rare, but teenagers who have every chance at income mobility. So the chart happily shows that fewer of the full-time, long-term minimum wage workers we wanted to help have lost their jobs. On a similar note I find it funny that those who are telling me that I need to do these today to affect how the temperature will be in 100 or 200 years (as they claim, that is) are often the same ones now saying we don't need to pursue further drilling or oil shale because those things won't have an affect on oil prices for another 5, 10, 15 years. this is very interesting and may go a long way toward explaining the rise in the â€œlooking for workâ€ portion of the recent jobless numbers. I suspect it is no coincidence that the looking for work numbers among the young skyrocketed in the 2 months leading up to the july minimum wage rise. Iâ€™d be really interested to see what the increase in costs to the government in terms of welfare programs/unemployment payments etc. are from this sudden turfing out of our teens. obviously, the assumption that raising the minimum wage just makes all the low income workers better off is grievously flawed. why no one in Washington has the cojones to step up and make this case plainly is just beyond me. make people more expensive to hire and companies will hire fewer of them. this is incredibly simple, yet no one seems to be able to communicate it. minimum wage rose 13.5% from 2005-2007. employment seems to have dropped 24% for the category. In the last 8 years teen age employment fell 6 of those 8 years. But only in the last two has the minimum wage changed. 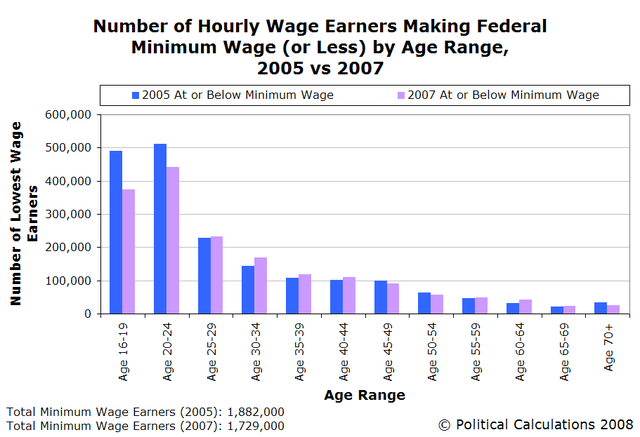 I am not arguing against the minimum wage contributing to lower teen employment. But the data sure implies that something else is the dominant factor at work here. When you have six years with no change in the minimum wage and teenage employment fell in four of those years, or two-thirds of the time, it sure seems a stretch to blame the minimum wage for that weakness. Average wages have risen every year since the depression. Your theory says that higher prices causes demand to fall. So the natural conclusion to derive from your application of proven economics is that because of the rise in wages over the last decades the total unemployment rate should be over 100%. I don't see the argument you've made as complete enough for me to tell what you are saying. However, the statement that increasing prices lowers demand has the caveat "all other things being equal." Since the depression, a lot of things have changed, such as the value of a dollar or the skill level of the workers. I don't see your statements as supporting your conclusion. The dominant factors are, as always, general economic conditions (growth, inflation, etc.) and demographics (supply of 16-19 year olds!) Keeping in mind that you're citing an eight-year period that coincides with the top and bursting of the dot-com bubble, which artificially inflated the economy of the late 1990s, including the labor market which lagged behind the plunge of the stock market, it's no wonder that you count so many declining years - you're starting from an unnaturally high and apparently unsustainable level of employment. Going back to those factors, they most certainly did affect the market between 2005 and 2007, but where jobs for teenagers are concerned, the increase in the minimum wage affected them more. Otherwise, we wouldn't see increases in the number of jobs making above minimum wage in addition to the decreases recorded for minimum wage earning positions, especially for those Age 16-24. The net decrease in the total number of jobs between 2005 and 2007 for those Age 16-19 and Age 20-24 were more than fully accounted for by reductions in the number of minimum wage positions, suggesting that all jobs that disappeared during this period for these age groups were minimum wage earning jobs. If you follow the seasonally adjusted monthly employment levels for the Age 16-19 group, you can see them drop immediately beginning with August 2007, just after the minimum wage increase occurred on 24 July 2007. That decrease occurred despite real economic growth during the quarter spanning July through September 2007 clocking in at an annualized rate of 4.8%. And before increased rates of inflation beginning in September 2007 (to which it most likely contributed). the key factor in determining wage increases over the long term (apart from inflation adjustment) is productivity. advances in technology, communications, and processes have caused the productivity of skilled workers to soar. as a result, so have real wages. however, at the low end, these factors have less impact. therefore, more than ever before, a lack of skills results in a substantial wage penalty. if your role has not become more productive, your wages do not rise. if you look at the lowest decile or two of wage earners, their real wages have been declining for years. but raising the minimum wage to artificially inflate their wages will cause unemployment if it outstrips the gains in their productivity. if burger flippers have become 15% more productive but 25% more expensive, someone is getting fired (all else equal). the other option is that prices go up as they have recently in san francisco restaurants to reflect the new costs of meeting the healthcare mandate. While the minimum wage relative to inflation was less than it was 35-40 years ago, the proportion of people back then who worked for minimum wage was much greater than it is today. I care more about 20-24 year olds than teenagers. ... the chart happily shows that fewer of the full-time, long-term minimum wage workers we wanted to help have lost their jobs. Today's teenagers are tomorrow's 20-24 year olds, and will need to develop the job skills and experience now that they will need in their early twenties to get the kinds of jobs that let them start building a life. If a teenager can't get a job now, his 20-24 year old future self loses.